MAN IN PAINTING SEES THE WORLD: DEMO'CRAZY' ! sorry dear..i am reading your post "realization" and that is a new realization! Good satirical pic !! :) You have a gift of conveying thoughts through images.,. It is the work of a highly mature artist. The picture says quite a lot of things too but words have their own importance...isnt it../? good one.. a combination of satirist pungency and hilarity which matches the craziness of our present times.. Perfect .... rite on target man!!! shouldnt it be DEMON-cracy lol! The picture should always tell the story...less words more dimensions..
i tried to make each one of them unique..even the scale was purposefully distorted..
i did it in many ways..
"Once again I have successfully exercised my 'right to lose'.."
"There is only one permenant losing party"
sure...that wiil be my gift..
great construction..even when you jot comments.. 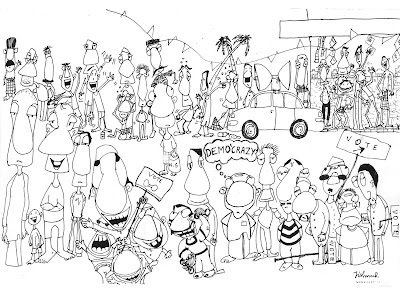 Sad 'We, the people of India' make good cartoons...But, thoughts/concepts, they say are the starting point of change! Good concept and good representation! Interesting...It captures the mood so well!!! Impressive Cartoon, reminds me of something that I read many years ago that goes "I have neither the time nor the inclination to explain myself to a man who rises and sleeps under the blanket of the very freedom that I provide, and then questions the manner in which I provide it." Ever thought of publishing your cartoons? we are majorly makign up honing past skills are we not? actually baldness is due to 'criss cross inheritance'..but reality tells another story..
when i start drawing i didnt think of anything..but after it was complsted no space was left anywhere for 'dialogues' but there was a small space above that poor chap's head..and i knew he had something to say..
a cartoon is the starting point of a debate..
rofl :D . . .that was awesome. . .We have a bunch of crazy ppl gathering up to give us demo'crazyyyyy . .
it's election year in our country so i can relate... good one! @fantasies of a life time. it is the same everywhere.. Thanks for stopping by my blog and I do hope u come by again. like your blog , enjoyed the cartoons. and you rightly knew he, the poor old chap, was the one who had something to say..
a cartoon is the starting point of a debate..very true..keep cartooning 'us' :-) let's meet, maul and refine..thats the way in politics, it seem to me. haha... democracy is where everybody wants a share in the pie.. If u see DEMO is like deemo- bringing down or deymo like an ad/ preview where people flock everywhere to get a glimpse and then go crazy saying "oh watever". Please visit, not to say, comments appreciated. that was a wonderful expression! The pic speaks a thousand words! nice cartoon yaar....i'm amazed...frm where on earth do u get such ideas???? This is too good. The pun in democrazy is not lost on me. I am witnessing the fight under a 'liberal democracy' tag in US and I have to admit that it is not very different from India, just that these guys are too suave with it.